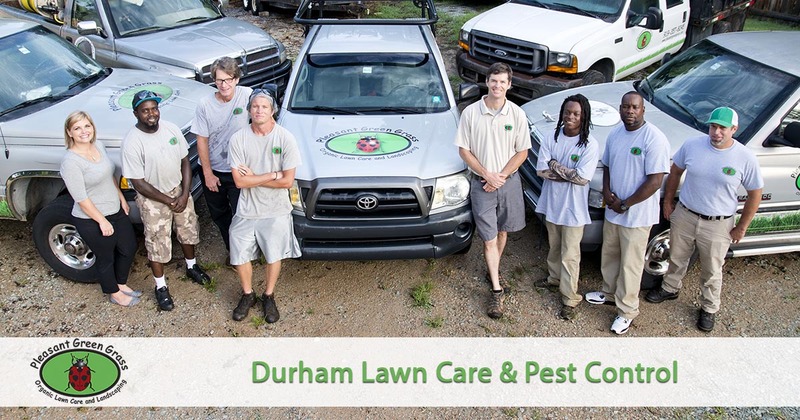 If you are looking for effective lawn care and pest control services in the Durham, NC area that are safe for your family and pets, then look no further. Pleasant Green Grass offers organic lawn fertilization and pest control services that are safe for your family and pets. From thrilling basketball games to quaint historic offerings, Durham, NC, seems to have it all! But one thing that can remain a challenge is locating quality lawn care services. Since 2006, Pleasant Green Grass remains the top choice in local landscaping and yard pest control. Unlike other providers, we continue our dedication to entirely organic methods of giving your yard the best care possible. Whatever issues your yard suffers from, we have the natural and efficient method of solving it. When you choose us, your yard receives top to bottom care on every visit! Call today for your best yard care service. We handle all your concerns the way nature intended! Whether you’re looking for professional monthly yard maintenance or have an immediate concern, our team handles it all! From newly installed yards to aging lawns, we care for them right each time. Choose us for your lawns weed control and fertilization needs, and more. If your grass requires core aeration or even if you’re planning a whole lawn renovation project, we are here for you! Your yard may look great, but it may also be home to a variety of different pests. While you could coat your lawn with toxic chemicals, we prefer a natural approach. Our outdoor pest control takes on all your pesky bugs. Whether you have fleas and mosquitos biting you, ticks, spiders, grubs, or anything else that crawls, we have the solution for you! Give your yards the safe, natural treatment that it deserves! Call us today to schedule your best local landscape solutions. We guarantee better results without the mess. Keep chemicals out of your yard and hire us! The organic lawn fertilization and pest control services we offer in Durham, NC are healthier, safer, and more effective than traditional chemical applications that are harmful to people, pets and the environment. Give us a call today and experience the difference in working with a company that cares as much about the safety of the products we use as we do for our customers.